Winter Magic by Hayley Westenra - Sometimes when classical artists put out a Christmas album, it ends up sounding sad: they try and show their vocal ability, so they songs end up slower and hence more sorrowful in tone. But Hayley has a nice Christmas album. It's mostly traditional albums with a few lesser sung ones and a couple of originals. Her vocals are beautiful and smooth but also happy. Noel by Josh Groban - Josh is more pop crossover than classical, but when his Christmas album came out several years ago, it felt like the first time I was hearing these familiar songs sung well. He stayed with more of a traditional, decorative approach to this album that suits Christmas. It's also a generally good selection of songs. Holiday EP by Blondfire - Having these two classical Christmas albums, it was a little different or me to get an indie pop selection, but I was a big fan of Blondfire (I still am, just maybe not as much of all their newer music). And these four songs have made a nice addition: they're soft and cool like a snowy evening, with a touch of vintage style. They're all, I believe, original songs, which means there are less repeats of the usuals. "Do You Hear What I Hear" and "It Came Upon a Midnight Clear" by Flyleaf - I also really like Flyleaf, so I have both of their Christmas singles. A little more of a rock sound here, which, again, differs from the crowd. But at the same time, a new approach to a regular song is good. "It Came Upon a Midnight Clear" by Norah Jones - This (along with the following two songs) was a free download from iTunes. Although I don't usually listen to Norah Jones, she does have a talent for singing. Her rendition of this song is clear and classic. "Christmas in the Room" by Sufjan Stevens - This song has a soft, slightly bittersweet sound that makes for a quiet, in-between moment. "Twinkling Lights" by Office Romance - More upbeat, this one's just a random glitzy, indie pop type of sound. "Silent Night" by Forte - Included on their first album, this song from Forte has a completely classical sound, soft and strong with clear vocals. "All I Want for Christmas Is You" by Alex & Sierra - Back to pop, we also come back to the casual, upbeat, glowing sound. Campfire Christmas by Rend Collective - These last four items are my new additions this year. Opening up iTunes, I decided to take a look at this newly-released album--and promptly loved the spirit of it. It's celebratory. Absolutely celebratory. It's a lot of recognizable Christmas songs with a couple of new ones, but everything feels new. The arrangements are so unique and specific, and everything celebrates everything that is wonderful about Christmas. It's one of the best Christmas albums I've come across. This is Christmas joy and Christmas spirit. Into the Silent Night - EP by KING & COUNTRY - I'd never heard of this group, either, but their album has a nice mix of a slight rock sound within the Christmasness without going overboard. Two regular songs and two new ones. "Mary Did You Know" by Kutless - I kind of wanted to get one of their Christmas songs, but most of them either felt like repetitions of what I already had or just not interesting enough in sound. Since I like this song, it was the one I went with. More of a rock sound again. "Away in a Manger" and "I Wish You Christmas" by Katherine Jenkins - Now back to classical. Strangely enough, I came across Katherine Jenkins years ago when I was listening to a lot of classical and classical crossover--but I thought she wasn't the best singer. Then I watched her in that Doctor Who Christmas special from a couple years ago and was amazed at how beautiful her voice sounded. I guess it's been several years since I first listened to her, so she probably has continued with voice lessons, as any good singer does. Anyway, I had to pick out a couple of songs from her Christmas album. They're rich and melodious. I love Thanksgiving and while I realize that part of the fun of Thanksgiving is that it ushers in the Christmas season, I do wish that there were more specific Thanksgiving offerings available. Turkeys to decorate with, cards to send out, movies to watch. The problem with the few Thanksgiving stories out there, though, is that they're mostly the same: some sort of problem arises as Thanksgiving day is looming but the characters make up with their families just in time for dinner. Okay, family and eating are a big part of the holiday, but what about stories that aren't specifically Thanksgiving but still touch on the broader themes of the holiday? In no particular order . . .
1) Little House on the Prairie - I throw this one into every category because it's always so perfect. But whether we're talking about the one book, the whole series, or the TV show, it has the same concepts. Family, very good friends, new relationships with new people, hard work bringing in results, and complete and utter thankfulness for the things that are good. 2) Silas Marner - This is an odd choice since the story is British and the time is the 19th century, but this story has a very striking illustration of familial love. Silas loved money until it was stolen from him and he found the child Eppie in his house, choosing to adopt her and coming to love her. She, too, cares for him--enough to refuse the offer of a wealthy social standing that eventually comes from her biological father. 3) Pretty much every reference to food in The Hobbit and The Lord of the Rings - If ever there were people grateful for food, it's those on long travels with dwindling supplies. Or hobbits--or hobbits on long travels. Whether it's a feast in Rivendell, a homely bounty in Bag End, lembas on the road, or provisions from Faramir's company, food in these stories is always accompanied by thankfulness and a great relish. Oh, yes, and the bond among the people who are breaking bread together. 4) A Little Princess - Sara has a true Thanksgiving spirit. She begins wealthy--and very sociable. But not only does she make friends with the other girls in the school (including those on the bottom of the ladder), she also befriends Becky, the maid. When she's in this higher position, she shares food with Becky--even once Sara loses everything and is starving herself, she still shares food with others. And she keeps up spirit, for herself and for Becky. That's friendship and appreciation. 5) Little Women - I suppose if I put Little House on the Prairie and A Little Princess on here, then Little Women has to come, too. Basically all the same things I said there hold true here--friendship, family, giving out of both plenty and poverty, and thankfulness. These were the completely random first five stories I thought of, so I'm sure there are plenty more. But my point is, let's think about Thanksgiving as we celebrate it. Let's get excited. Let's remember it as a coming together of people, of a time of bounty and accompanying thankfulness, of sharing what is good, and of rejoicing in what is good. I realize that, while I bought this chocolate rose on Halloween, it is now more than halfway through November. It's Turkey Time, with Christmas just around the corner; Halloween is now nothing more than a passing fancy. But I did want to put this rose down in the records, even if I'm a little late with it. It's from Albert's Candy, a name which does not sound at all familiar to me. It's a single black stem with one chocolate rose wrapped in black foil. 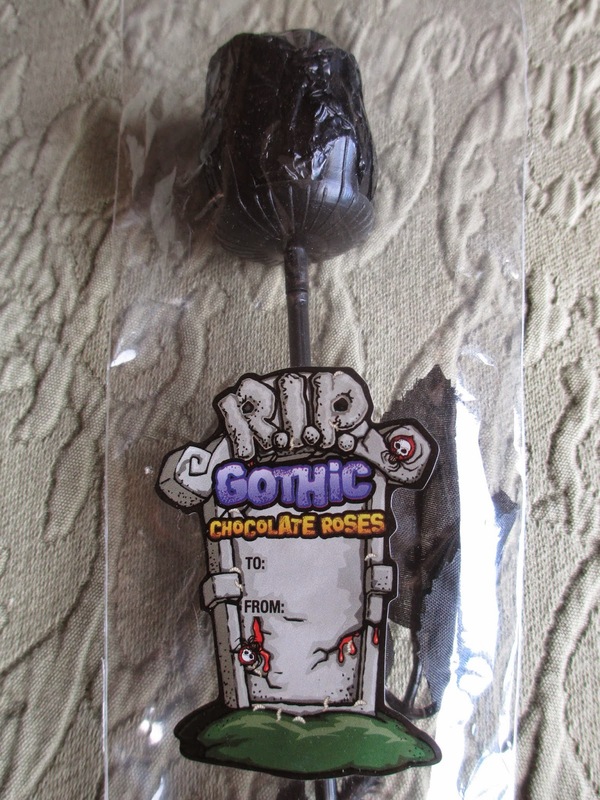 It's called a Gothic Chocolate Rose, and it comes with a place for To/From so that, I suppose, you can give it as a gift like a real rose. The clear sleeve that carries the label acts like the sleeve that would carry a rose--in fact, it's a nice effect, which is why I picked it up to begin with. I had thought that I might carry it around, a single black rose, during the evening. But I was busy eating candy and people-watching and going out to dinner and all that sort of thing, so the rose remained lonely. I've mentioned that I was out of town Halloween weekend, so I had half expected this rose to not survive the return journey very well. I was mistaken. Undamaged it remains, and might I add that it is fairly well molded for a casual candy novelty. The 18 ounce rose is lovely, perhaps even lovelier than a real long stem rose (I prefer freshly picked, full blooms--the long stem kind have always looked fake to me). And you know what's also so nice about this small rose? You can enjoy it for the novelty without being left with a large amount of cheap chocolate. Eighteen ounces is small enough that you probably won't get sick of it before you're done. Maybe this sounds silly, but I am entirely in earnest. It's also true, though, that this chocolate isn't the worst in the world--especially when it comes to novelty chocolate. Sometimes there's too much focus on the play and not enough on the taste. This chocolate isn't loaded with grease and even has some slight berry notes to go with the usual caramel/vanilla flavor. The rose is, of course, hollow--wouldn't want to be breaking teeth. Once it's gone, you're left with nothing but a black stem, but you know what? This chocolate rose was fun. It is the Month of the Turkeys . . . and nothing could please me more. Throwing turkeys around is like happiness. They're all over my new bookcase, even this little lollipop turkey that proclaims everywhere that it is 100% edible (because, frankly, I suppose they're right in thinking that it doesn't look all that edible). The blue turkey puppet (Did I get it in Santa Fe or San Diego? 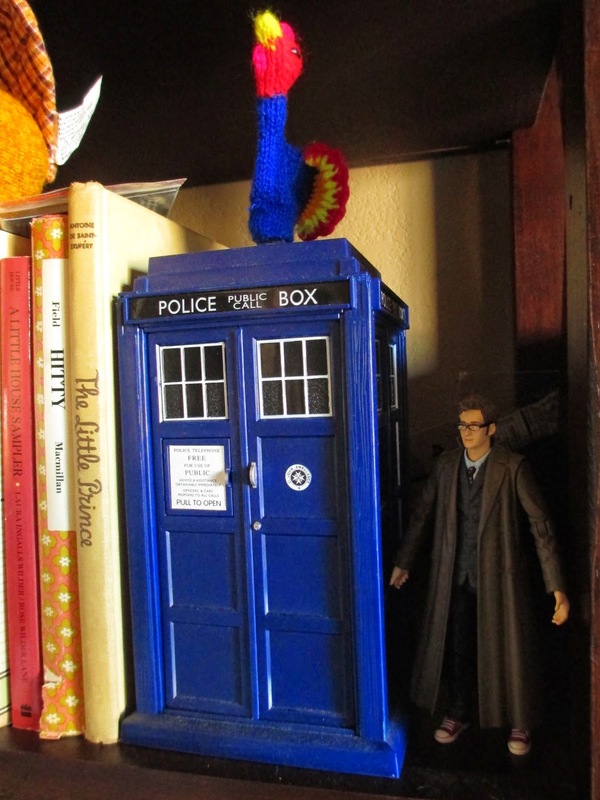 It was some years ago) sits atop the TARDIS. Blue on blue. I try to improve each Thanksgiving, to get more excited or to create even more of an event. Last year I tried making stuffing for the first time without a box mix--it took longer, but it was so worth it (and, frankly, not even hard). This year I started bemoaning the lack of bread selection. It might have been possible to order someone coming from more of a city area to bring rolls, but I wanted to choose them. So it came to the next option: try making them. I tried out the recipe yesterday (it's this one from Martha Stewart), and it turned out right. I've always been afraid of yeast (yes, from just one bad experience trying to bake), but this was fun. Such a soft and light dough that I didn't even mind kneading it. So today's lunch? One roll filled with some leftover steak and another roll filled with thinly sliced cucumber, all served on my turkey plate. I wasn't exaggerating when I said I had a lot of turkeys around. The Day of the Turkeys doth approach. I'm usually quicker when it comes to The Hillywood Show. But it feels like everything has been off this time. Trouble is, I started getting sick over the weekend (and as is often the case, I know who got me sick--you know who you are). And Monday was my worst day. I was watching Tangled and getting very sleepy--but the parody was out when the movie was over. So I opened my laptop to watch, said, oh, that's nice, and then closed my laptop and fell asleep. Not the gratitude Hillywood deserves. I still haven't watched the two behind the scenes videos, over an hour of footage that I'm sure is wonderful, as usual. It feels strange to talk about the parody without having seen the extra footage. And it's also strange to talk about a parody whose source material I've never seen. It feels like that hasn't happened with Hillywood in a while--though it's only technically been since their Warm Bodies Parody last year. And that was another zombie one. Coincidence? But that parody had such a perfect storyline of its own that it wasn't really necessary to have seen the movie first. This parody is a little different. I understand that it has different moments from the show, but it also has less of a storyline. It's more about setting than events. The characters, the type of situation going on, the places. So that's easy to follow if you haven't watched the show. And what stands out right away with this video is sleekness. Perhaps the new partnership with Nerdist is paying off because while Hillywood's always been sleek, it's even more so this time. And the slow-motion on the dances, that just fit so well and looked so good. While Hilly's played plenty of male characters and has had some amazing makeup, her character here is so fully put together that it did take me a moment to realize it was her--and I'm always expecting her to be in a new video. I'm always looking to see who she'll be, and as good as the makeup and acting are, I can always tell. But this time it did take me a moment. So I'm still not really interested in watching The Walking Dead. Funnily enough, the very parody that could have been reason enough for me to watch the show has also half convinced me that it isn't the type of thing I want to watch. I'm so strange. Anyway, though, this was another polished video from The Hillywood Show. I've been asked if I have a Goodreads account and after passing the website by for some time, I've finally decided to try it out. But it's odd: I'm not a social media guru and so I wonder if I'll even end up doing anything with my Goodreads account. That is, I've started adding my books. I have about 244 up--and that is nowhere near all of them. You can have a look, if you like: click here to see my page. Given how much I like organizing my physical books, I'll probably also enjoy organizing all the titles online. But I don't like the five star rating system much (whether toward food or books or whatever else): my opinion is always more complicated than that, and so much of Goodreads seems to be based on the stars you give to each book. Or maybe it's more about setting reading goals and finding new things to read. But I like to read at whatever pace I feel like at the moment, and I already have plenty of books that I want to read, so I don't really need to find anything new. Or it could be about talking with other readers and with authors. But there, again, we come to the social media question. Sure, social media's great, but I'd rather talk to someone in person about what I'm reading. Typing it all out in an online conversation, well, that's different. Maybe I hesitate because to me, reading is such a personal thing. I like to read whatever falls into my hands, not whatever is popular. Maybe a book I read referenced another one--so I'll read that. Or I enjoyed one book by an author, so I want to read the rest. Or I find a book at a museum shop. Or I'm browsing the bookstore and something calls out to me. Whatever way, they're books that I've made some sort of connection with before even reading them. If it's just a title that was recommended to me by a website, then that connection is lost. If it's just something popular that other people with my tastes are reading, then maybe I'll like it, but then I also feel like my opinion isn't my own anymore. But I guess not everyone uses their Goodreads account so often and so extensively. Maybe I will like it as an online catalogue, as a quick place to compare thoughts on books. But will I end up using it, or simply wander away after a while? I was in California for a couple of days, and while I was there, there was a bit of time that was free. Given that the weather was (mostly) nice, it was the perfect time to be outdoors. 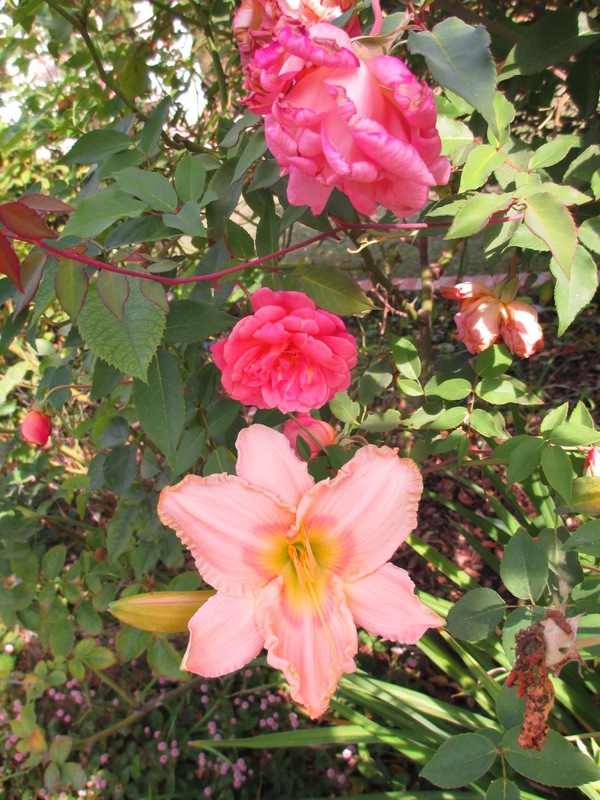 So it turned into the time of gardens: the Arboretum, the Huntington Library, and Arlington Gardens. I've been to the Arboretum innumerable times. While some people who grew up in Southern California say Disneyland was like their park, my family never had annual passes. We would go to Disneyland, but not as often as that. So the Arboretum was my park: eating oranges in the groves, playing hide and seek among the trees, walking through the bamboo paths. It's a gorgeous place, but somehow also casual. And did I mention the peacocks? They're everywhere and very used to people being around. This time, I saw one with her two babies. The Huntington Library I actually have many less memories of. And the last time I went was, oh, probably at least ten years ago, maybe more. Besides the gardens, there is also art--and the famous library itself. Those types of things I wasn't as interested in when I was younger: I had less context for them. But this time it was exciting. Ooo, there's a Corot painting here. Ah, yes, I can see Fuseli's style in these images, even though I'm not sure if I've seen them before. Look, those paintings were on one of my textbooks. My, these paintings are so old--hundreds of years old. Wow, they have a Gutenberg Bible here. Look, a letter from Mark Twain. And that's Shakespeare's first folio. Not to diminish the gardens, here I give one of my favorite of the roses, a merry yellow called Golden Fleece. After viewing all of these grand gardens, Arlington Garden in Pasadena was completely different. It's a little nook not far from Old Town. It's free, so it's more like a park, somewhere you can just walk into. The garden is younger than the others and less formal. There are benches and tables for sitting or reading. The plants vary somewhat, trees and bushes and flowers and plants chosen for their heartiness in climates with little water. Visiting this place was like going to Beatrix Potter's garden, like receiving a way to apply gardens to your own home. While the Huntington Library's gardens are grand, we can't all have gardens like that. So visiting all three places was like going full circle through beauty and nature and culture and fun and applicability.